The Little Shickshinny Creek flows into the Susquehanna River at the small town of Shickshinny. 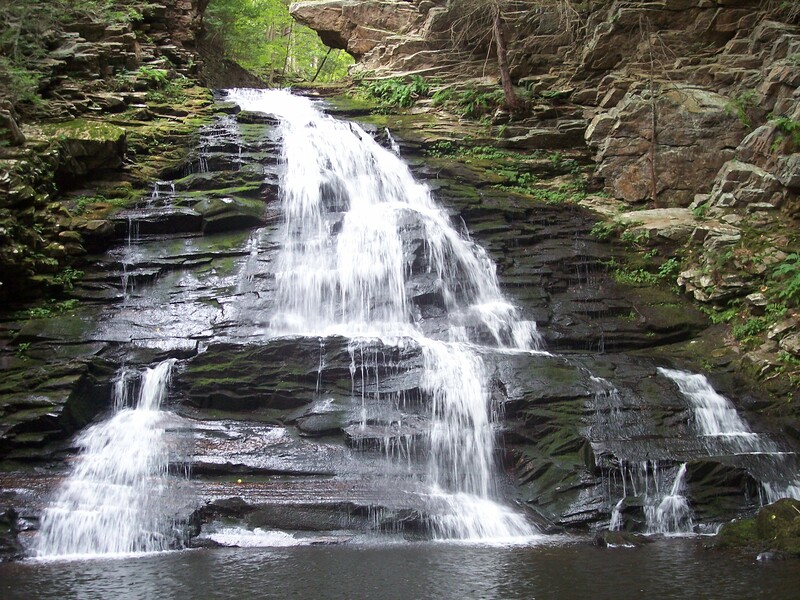 Along the way it has carved a deep gorge that harbors a beautiful waterfall in State Game Lands 260. 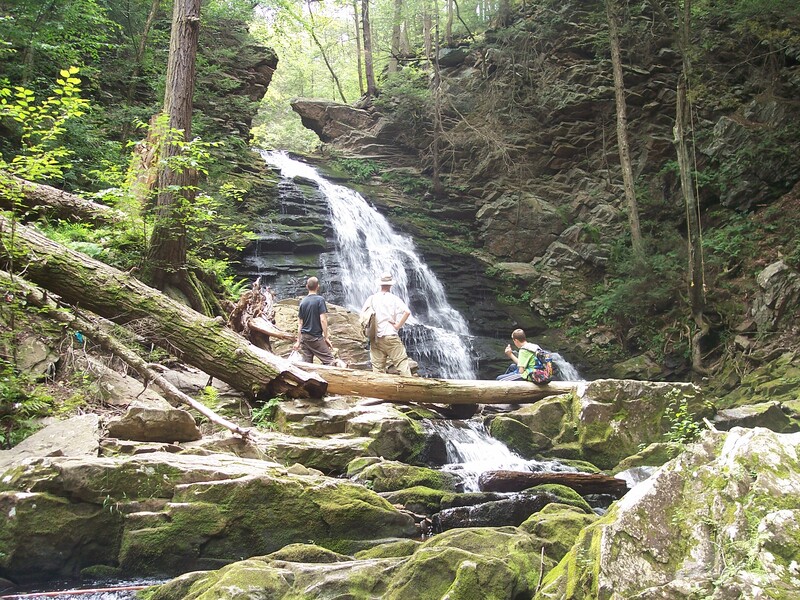 The falls is hike number 21 in Hiking the Endless Mountains. From the parking area, we followed an easy trail through forests of hemlock. The trail is an old forest road, just west of the parking area. The sound of falling water could soon be heard far below. We reached the top of the falls and descended via narrow switchbacks to the bottom of the cascade, where there was a deep pool. While the height may be 30 feet or so, what makes the falls so impressive is it setting. It appears as if the layers of sandstone bedrock had been upturned, creating fins of exposed rock. There is one such fin at the top of the falls. The water seems to have chiseled into the one cliff face. Below the falls are more cascades, dashing over the upturned bedrock between small pools. The creek continued on, deeper into the gorge under hemlocks. In the spring, dogwood blossoms dot the forest. The top of the falls has some kind of old waterworks, with a small dam and old pipes. 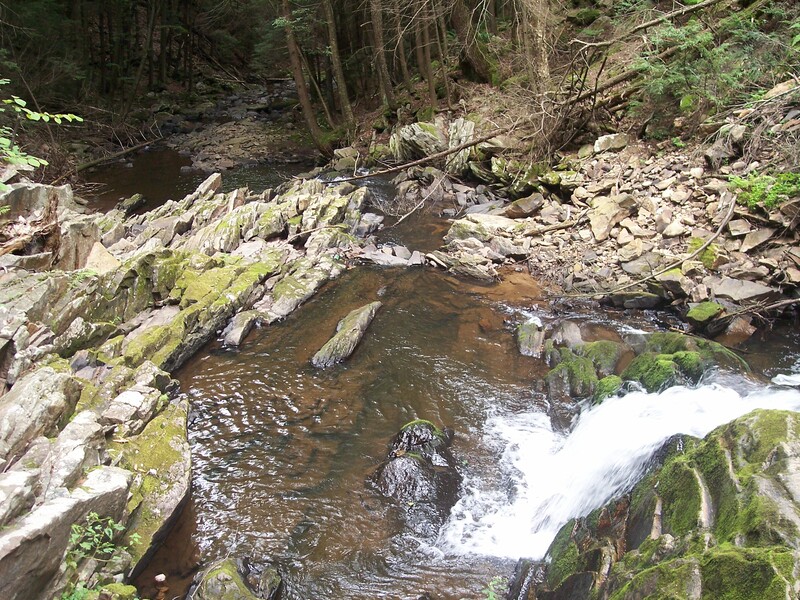 Maybe the creek was an old water supply for a mill, or the residents of Shickshinny. The creek below the falls. We sat and enjoyed the spray of the water over the moss-covered rocks. Everyone in the group was impressed by the beauty. The hike to the falls is easy and ideal for children, although the base of the falls is rugged and the switchbacks are narrow. For those looking for a quick hike that offers significant natural beauty, this is the place for you.